MCKINNEY, Texas – February 20, 2019 – Sigmetrix, global experts in GD&T and mechanical variation, announced they will be a Silver Sponsor of the COExperience, February 24-27, 2019 in New Orleans, LA. They are also the sponsor of the Engineering Analysis & Simulation track that will focus on the processes, methods, and tools for modeling and synthesis of engineering systems and for engineering analysis and simulation of products. The Sigmetrix team will be at booth 313 in the TechniFair to demo their products and answer any questions attendees may have. Attendees will want to hear Stephen Werst, Director of Customer Success and Product Strategy, present “Getting it Right, before it’s Built: Using EZtol and CETOL 6σ for an Integrated, Low-Risk Approach to Tolerance Analysis.” The presentation will be in room 1201 on Wednesday, February 27th at 2:10pm. 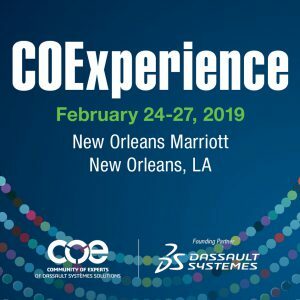 COExperience is a three-day event bringing together expert users of Dassault Systèmes solutions. Attendees will enjoy keynote presentations from industry leaders, see the latest product developments, learn solutions to your business challenges, connect with other experts during networking receptions and visit the TechniFair, featuring key industry vendors. For more information about COExperience visit http://www.coe.org/2019conference. Would you like to see CETOL 6σ in action for yourself? Sigmetrix is a global provider of comprehensive, easy-to-use software solutions that help users achieve robust designs through tolerance analysis and the correct application of GD&T. With over 25 years of research and development, Sigmetrix products eliminate the error between as-designed assemblies and as-produced products. For more information, visit their website at www.sigmetrix.com.